No need to subscribe, give out your email, join anything and you don't even need to be a member of the Forum or The E-Type Club! 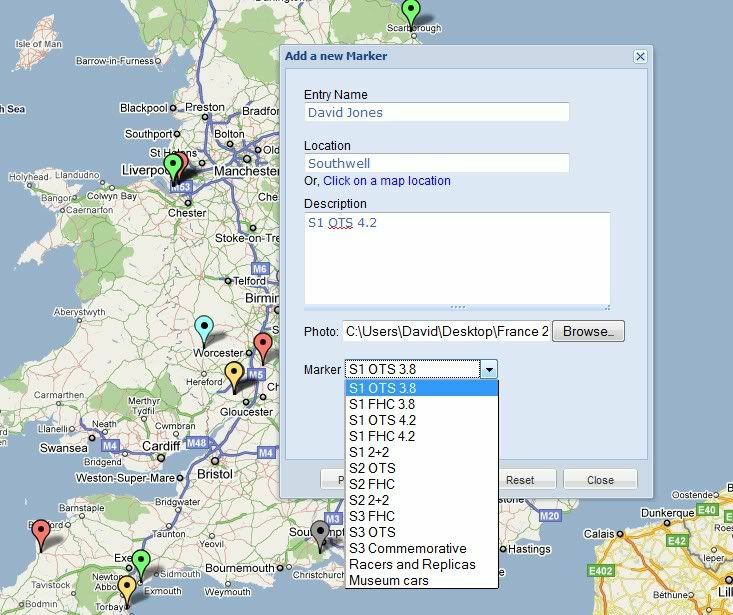 Basically it is an E-Type owners map you can annotate with your location, user name, photo and car type. Obviously it would be sensible not to put in your exact location but a town name, postcode or even a nearby field would work. At the bottom you will see a list of coloured push-pins which I have added, one for each model type. If you fancy entering into the spirit simply click on the third menu item 'Additions' and then 'Add marker - simple'. Enter your details, choose the push-pin from the drop down list to match your model and then click submit. Map is world wide so use the zoom and pan controls to move about. Clicking on a push-pin should open a box with the owner name, details and maybe a photo. Click on an existing pin for an example. Don't worry if you make a mistake you can delete the entry or change it at any time. An update on the E-Type map feature. As of 1 April Zeemaps introduced a $20/month subscription for this service. Julian Barratt has kindly agreed to sponsor the World Map of E-Types and it will now include the SNGB branding. All the existing map pins are there so please feel free to add your E-Type to the map (instructions in the above post). It is a useful feature as it gives owners a sense of how many others are around them.